When I nominated Burger Bobby for the Bloggers Choice Award in Timeout KL, it hit me that I haven’t had his burgers for quite a while. But my reason for that was simple – Bob makes deliciously sloppy burgers and I can’t say no to any of his burgers. Last week, I gave in and ate more than 1000 calories worth of his burgers. But it was all worth it, to me at least. Within 6 months, Bob expanded his burger stall – at least 10 tables were set out for customers – and a new burger menu. I wasn’t that surprised to see his business grow 3-4 folds; he works hard and deserves every bit of adoration for his burgers. What surprised me was his new menu. Bob created a burger series and named it after me! The “BangsarBabe Special”. *Disclaimer: I did not know Bob named a burger series after me at the time I nominated him, and even if he didn’t, it wouldn’t affect my choice. 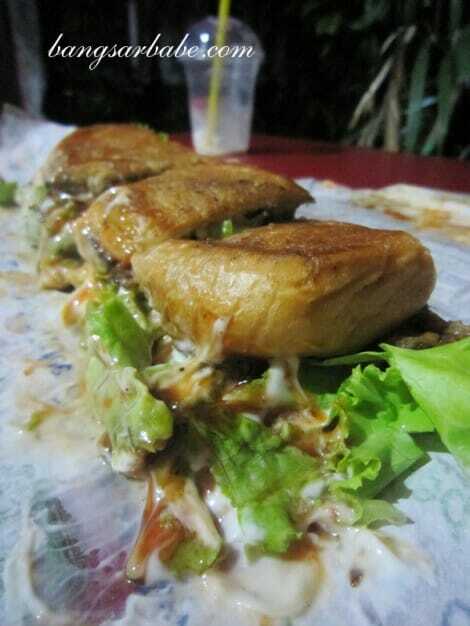 Being greedy, I ordered the BangsarBabe Triple Special Cheese (RM9.50). The place was packed with customers that night – I waited for 45 minutes for my burger and it was worth the wait. The BangsarBabe Triple Special Cheese was a massive assemblage of three chicken patties, two slices of cheese, caramelized onions, fresh onions, tomato slices, shredded lettuce, omelette, his homemade sauces and a way-too-small burger bun. If you think a basic triple special cheese is sloppy, wait till you try this! Bob said he created this burger to represent me. How on earth does THIS represent me?? “You kurus, tapi gelojoh! (you’re skinny, but greedy!) 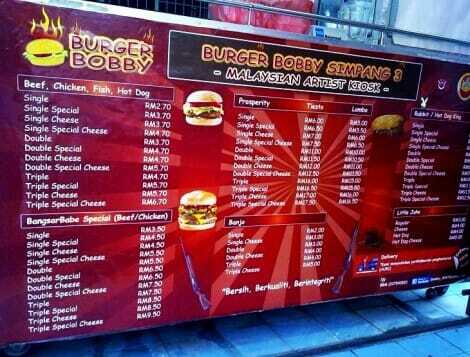 Sebab tu I buat burger macam ni…(that’s why I made the burger this way)” Bob said. That rationale made sense. LOL. 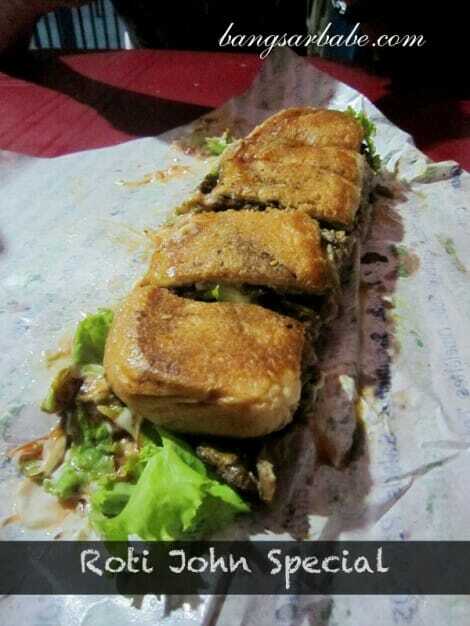 The BangsarBabe patty isn’t your usual Ramly burger patty; the meat used is leaner so each bite is more solid. Tastewise, it was better than his usual burgers because each bite was meatier, chunkier and more flavourful. Despite the triple stack, the balance of meat and other ingredients was just right – only, way messier! rif loved it too. My friend had a BangsarBabe Double Special Cheese (RM7.50) which he said was very good, so that’s an alternative for the less greedy. Anyway, here’s the address and GPS Coordinates to Burger Bobby. Don’t ask me for directions, I’m hopeless in that. But I know that it’s near Zoo Negara. Just key in the coordinates into your GPS and press “drive” lah! *Remember to vote for Burger Bobby HERE! may i know what time the bob burger stall open ? If I’m not mistaken, he opens from 5pm onwards…till 2-3am in the morning. never had it before but my cousin brought me there last night. well, it was out of the world experience! how did he come out with that sauce? I shared this with two people. Hi, I’ve tried a numerous time to this burger stall, mostly weekends, about 11pm, and always found that they are close, have they moved or closed for good? Yikes. I don’t think they are closed. Can you try calling the mobile number in the post? We need more people like you Sue, you bridge the divide between the races.